See Printing Artworks for extensive details of the features available for printing artworks. Tessera is designed to make printing as simple as possible. In many cases you will also have the option to copy text details onto the Clipboard or export data making it easy to format and print from other applications. IOS devices are unable to preview some screens ready for printing but have the option to preview by saving as a PDF. Use the Print button found on most screens to print or export the current found set of records. 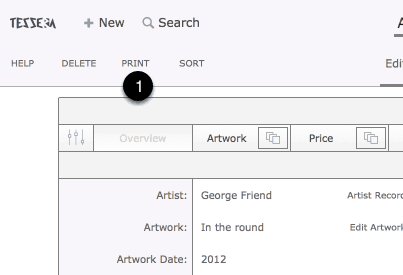 Use the Print button in Artworks or People and you’ll have the chance to export data instead of printing. See individual help pages on the components of Tessera for specific printing information.